Encourage a thoughtful analysis of the characters in any work of fiction/non-fiction with this chart on indirect characterization. Students complete a chart with five columns which requires them to cite specific lines of text evidence and use those lines to make inferences about a character's traits. 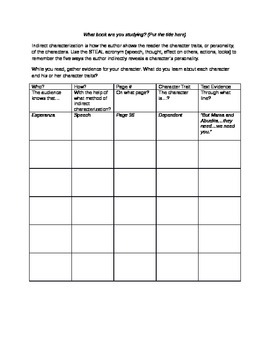 The best part of this worksheet is that any character's traits can be recorded, or you can choose a single character for your class to focus on. An example is listed for Esperanza from Esperanza Rising. Please rate this product after downloading; I would really appreciate your thoughts!